So, yeah.. it's part three of our series Great Beers available in Manitoba! The selection of beers available at the local MLCC stores is constantly changing week by week, so much so that a third part of this series is needed. In this series, I've also included a few seasonals that may not be available at your local Liquormart at the time of this article. Hops & Robbers India Pale Ale - The stable brew from Double Trouble Brewing out of Toronto, in fact - this is their only beer! A great hoppy IPA that's reasonable on the budget at $2.89 for a 473mL can. Great for camping, or just for those looking for a great IPA! Lost Coast Indica IPA - Any beer that shares the name of my favourite record label (Indica Records) is A-O-K in my books! This is a great IPA from Lost Coast Brewing out of California. A bit pricier at $6 for a 650mL bottle, but great for sharing! Flying Monkeys' Smashbomb Atomic IPA - You can already see a general theme in this piece, IPAs! The MLCC has really been pushing hoppy pales and India Pale Ales in the last few months, so much so that I would say 3/5 of all new brews that enter the Manitoba market are generally IPAs. Not only is this an incredibly tasty IPA, but it was also briefly banned by the LCBO in Ontario due to the name and label artwork. Trappistes Rochefort 10 - This beer was available in Manitoba for a very brief period of time back in 2010, but due to lack of sales, it was discontinued. Now, the beer has returned as there is a decent Belgian beer boom going on in Manitoba at the moment, people are starting to really embrace Belgian beers. 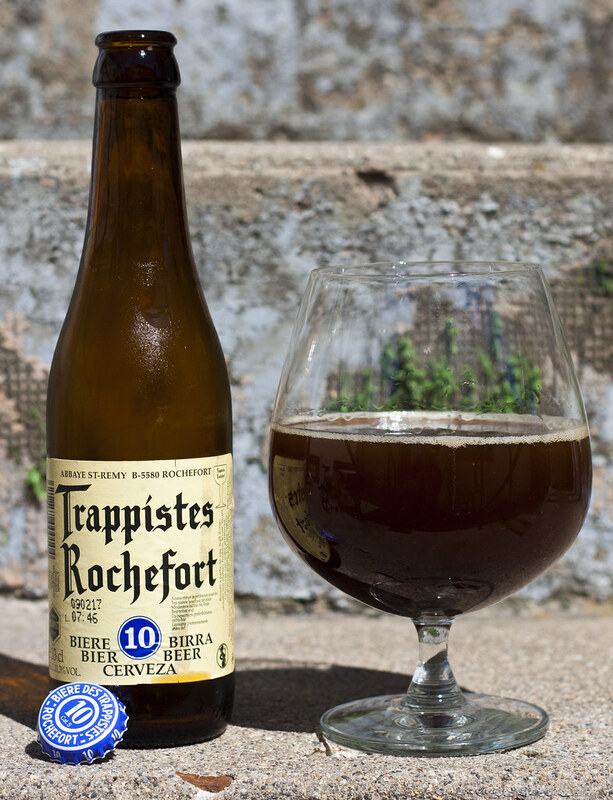 Rochefort 10 has an ABV of 11.3%, making it one of the strongest beers available in Manitoba. Cheaper here in Manitoba than in North Dakota ($4.53 here, $7 in North Dakota). Half Pints' Phil's Pils - I'm generally not a fan of Pilsners, but Phil's Pils is damned tasty. It's a nice summertime beer that doesn't skimp on the hops, so it comes out with a nice bitterness with a light citrus background. It's comparable to Sam Adams' Noble Pils, which hasn't been available in Manitoba since last year. Costs around $12 for a 6-pack. Muskoka Mad Tom IPA - Another IPA! This IPA is more of a bitter IPA than a citrusy IPA (like Little Scrapper). It does not skimp on the hops in any way. So hoppy that even I found it to be a bit TOO hoppy, but there's nothing wrong with that! Better being too hoppy than not enough! It costs $2.69 for a 355mL bottle. Muskoka Spring Oddity - When I try a beer, I generally know what to expect off the bat. In Spring Oddity's case, I had 0 clue what to expect in this beer. The name alone made me salivate as I could tell that this was going to be a beer that's going to compliment the changing of the seasons and maybe a beer to share by the bonfire. It turned out to be a sweet citrusy Belgian style ale, reminiscent of a Blonde de Chambly by Unibroue. A bit pricey at $10 for a 750mL bottle, but it's worth every cent! The label is beautiful, so much that I want to buy one of their tshirts! Maisel's Weisse Dunkel - This is only the second Dunkel beer available in Manitoba, the other being Big Rock's Dunkelweizen. This German Dunkel the superior of the two Dunkels. Maisel's Dunkel is a sweet, raisiny dark ale that in ways, reminds me of a rich barley wine, incredibly sweet and strong in flavour, a bit of banana. Quite a solid dark ale. Costs $3.55 for a 500mL bottle - quite a value! Brick Waterloo Authentic Amber Ale - In Ontario, Brick is better known for producing the Laker value brand of beer. They also can produce beer that's tasty for those who want a lighter ale, but don't want to compromise on flavour. Their Waterloo Amber Ale is a sweet caramel amber ale. At first it reminded me of a Molson Dry, but once I poured into a glass, it was more of a Sleeman Amber Ale. I enjoyed it, but not all will. It is $2.99 for a 473mL can and has a whopping 6.8% ABV! Bacchus Frambozenbier - Fruit beers are usually hit or miss for most people. There are people who adore a fruit beer, then there are people who stay away from them completely, thinking they're a niche. Bacchus Frambozenbier is a raspberry beer that was honestly one of the better fruit beers I've had, one of the better raspberry beers at that as well! It has a nice raspberry aroma, almost like a raspberry jam. As for flavour, near identical to the aroma, a bit of banana and overall - a great idea for a dessert beer to accompany that cheesecake! Pricey at $5.12 for a 375mL bottle, but always worth trying!